We use integrated structural biology to tackle questions about the structure and function of proteins, RNAs, and complexes in solution. Our goal is to develop in-cell NMR techniques in order to build metabolic flux models of carbon utilization in microbes that are important in biofuels/chemicals production. 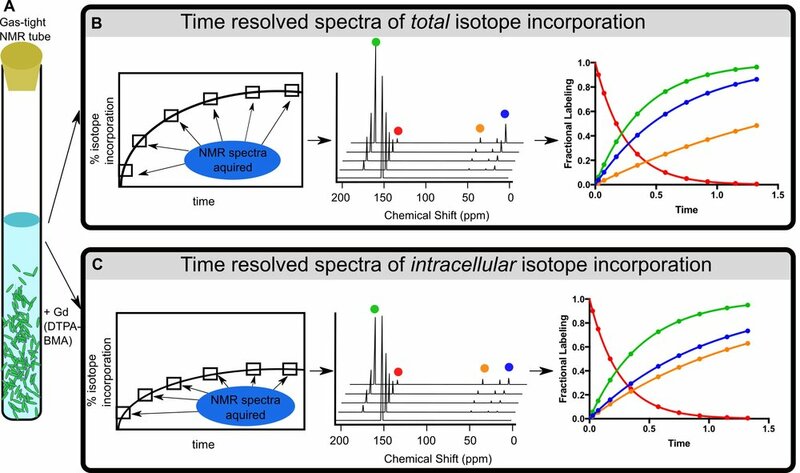 In collaboration with scientists at the National Renewable Energy Laboratory (NREL), we use NMR to detect the conversion of single atom isotope labeled metabolite tracers in living cells. We work together on teams of researchers aiming to develop next-generation drugs for the treatment of diseases including cancer and heart disease.